DALE AND KATY ARE COMING BACK TO KS FOR 2013....details coming soon!!! Thanks for a great 2011 and we would love to see you all in 2012. This year is gonna be set up much like last year but with limited access to the pool, an ice cream social,FREE ice, and biscuits and gravy on Saturday morning. If you are new to the contest we encourage you to ask some past contestants, fire us an email or give us a call. Pictures of our 2011 contest will be posted soon. 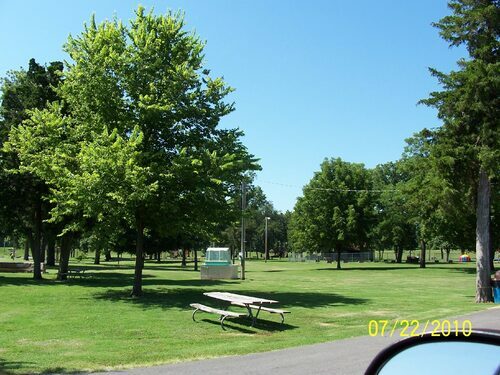 Our contest is located in a very large park which allows all sites to be located on grass, water and electric included, check-in extremely close. Indoor restrooms and showers are located in the air-conditioned Community Building where check in will be. This is a fun and relaxing yet competitive contest with Dennis and Linda Polson as reps with certified KCBS judges. Entry fee for this years KCBS 4 meat divisions will be $150 with a max of 48 contestants. Profits made from the cookoff will go towards recreational and educational opportunities for Allen County 4-H and FFA youth. This years prize money includes $3500 in payouts with trophies or ribbons through tenth place. Select Prize Money tab at top of page to view more information on prizes. Iola is located in southeast Kansas, Hwy 54 goes through downtown Iola and US Hwy 169 passes on the east side of town. Riverside park is located at 600 South State Street; more detailed directions can be provided if needed.